Maria Borio is a poet and a literary critic. She holds a BA and a PhD in Italian literature. She has written on the poetry of Vittorio Sereni and Eugenio Montale, and published the monograph Da Montale alla lirica contemporanea (2013). 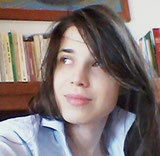 She is currently working on a project on Italian poetry from the 1970s to the present day. Her poems have been published in several journals and literary websites. A selection of her works entitled Vite Unite was included in XII Quaderno italiano di poesia contemporanea (2015). She is the editor of the poetry section of the journal Nuovi Argomenti, previously directed by Alberto Moravia and Pier Paolo Pasolini.